Anyone who has been paying attention knows that lately, bushfires have been occurring more often and with greater intensity than usual. Since the hot part of summer is here, it is especially important to protect your shed from bushfires. Whether your farm shed is a barn, stable, or storage sheds, you need to take precautions to lessen the risk of them catching fire. Because the standard farm shed as a lot of steel in it, and because people are more likely to focus on protecting their homes, most of us don’t see the farm shed as important. The problem, though, is that a farm shed that is within 20 metres of your home can cause your house to catch fire, either by embers, direct contact with flames, or ambient heat from the steel supports. The steel in your farm shed is usually Zincalume or ColorBond, and it won’t burn, but the same can’t be said for the contents in your shed. The steel heats up from the flames, and ignites any flammable materials that are inside the shed. The most common cause of home damage from bushfires is ember attacks. The burning embers fall into gaps and cracks between parts of buildings, and ignite whatever they touch. They usually enter under eaves, air vents, or roof cavities. Embers can sit for hours until they produce enough heat to start a fire, but once the fire starts, it is very difficult to put out. To keep your shed from catching fire and damaging not only itself, but your home, we recommend that you take some basic precautions. The first thing you must do is remove any flammable materials from your shed. 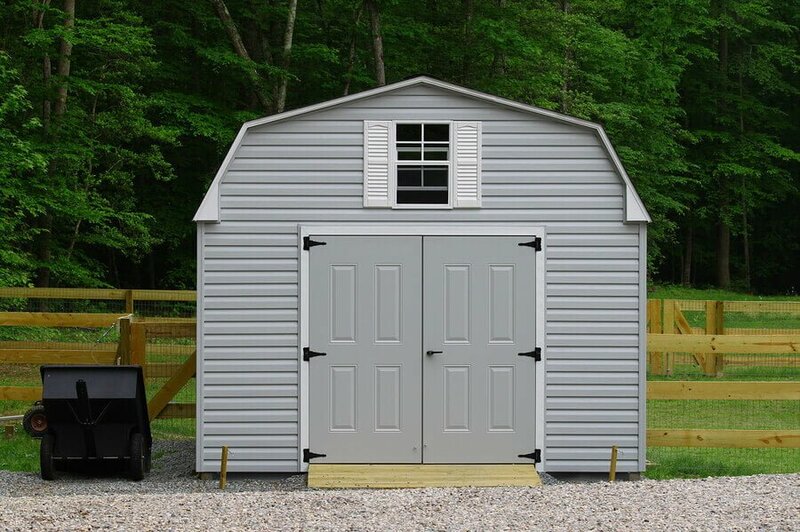 We know that the materials are often the main reason for the shed, but you need to find some kind of alternative. Next, make sure that you have installed weather stripping around the insides of the windows and doors to seal off your shed. If you are standing inside of the shed with everything closed and the windows shaded, you can usually tell if there is a gap by the slivers of light coming in around the doors or window frames. Next, you must install leaf guards on your gutters to prevent any buildup of leaves. Leaves ignite at a lower temperature than a lot of materials, especially if they are already dried out from the heat of a fire. An alternative to this is to manually remove any leaves from the gutters if a bushfire is approaching. If you are handy, you can ember-proof a roof by using a scribing tool and cutting the flashing until it sits flush with the roof sheets. You can also cover the external skylights with non-combustible firescreens. This sounds like a “no-brainer,” but is often overlooked; keep firewood away from the shed and from your house. Sometimes, especially in the summer, a pile of firewood sits so long that we don’t even notice that it is there anymore. That is fine most of the time, but can cause a lot of trouble during bushfire season. If you are considering getting a farm shed, try to erect it more than 20 metres away from the house and barn. Keeping your buildings apart is one way to mitigate damage from an ember attack. It obviously won’t matter with direct contact, but if buildings are far enough away from each other, some might be spared. We know that it is often an inconvenience to walk longer distances between farm buildings, especially when you are actively working the farm, but it is worth the precautions if it saves even one building from burning. Sometimes, though, no matter what precautions you take, the sad fact is that your house is just going to be swept up in a bushfire. At least if you take precautions, you give yourself the best possible odds of your property emerging from a bushfire unharmed. Remember, though, there is a time to stay and prepare for the fire, and a time to evacuate. Your house, while it is precious, is never worth your life or those of your family members. Obviously, when the authorities tell you to evacuate, you evacuate. But we recommend getting a “head start” if a bushfire is obviously coming your way, and the air quality deteriorates. Even a near miss from a bushfire can have severe consequences on your health, and some even die from the consequences of smoke inhalation. If you suffer from asthma, emphysema, or any heart or oxygen-related condition, we recommend leaving as soon as the air starts to become uncomfortable. You can always come back if you evacuate too early, but you often don’t have any options left if you wait too long.